Daily Illuminator: Super Munchkin Guest Artist Edition Available Now! May 22, 2017: Super Munchkin Guest Artist Edition Available Now! With Super Munchkin Guest Artist Edition right around the corner, we wanted to give fans a sneak peek of the amazing Lar DeSouza art found in the game! Of course you have new takes on the Door and Treasure cards, with classics like the Bat-Mobile, The Punster, and The Cowl. But you also get a full array of cardboard standies, two for each color, and the board itself. Lar's art looks like it's ripped straight from a comic book, so it's perfect for this new interpretation of Super Munchkin! We've also had the fortune of interviewing Lar for the Daily Illuminator, where he talks about the process of creating the game, as well as his charity work and other topics. You can find more of Lar's work on the Munchkin Playmat: Spyke's Christmas Wish and the upcoming Munchkin Shakespeare: Staged Demo! We'll even be giving away a signed copy (or two) of the game on Twitter, Facebook, and Instagram to celebrate the launch, so follow us there for your chance to win! 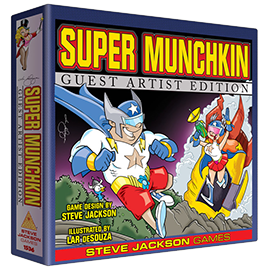 Look for Super Munchkin Guest Artist Edition at your local game store, or on Warehouse 23 if you don't have a shop nearby. It won't be around forever, so get it before it goes up, up, and away!